First responders help woman injured by the car attack on Saturday. Image via the AP. 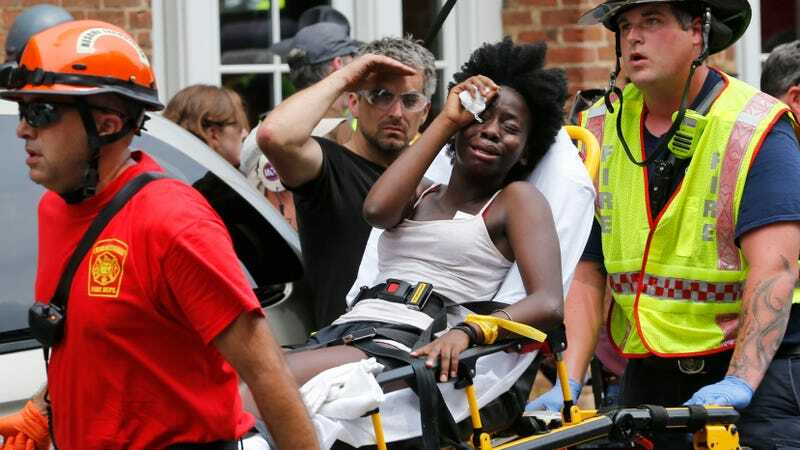 The suspect arrested for driving a Dodge Charger into a group of anti-racist and anti-fascist protestors yesterday–killing one woman and injuring 19 others–is James Alex Fields, Jr., a 20-year-old white man from Ohio. I mention his race because clear signs point to this being a race-related attempt at mass murder, and politicians are calling on Donald Trump to use the word for that: terrorism. From his golf club in Bedminster, NJ on Saturday afternoon, the president condemned the “hatred, bigotry and violence,” but in general terms–“on many sides, on many sides” without identifying the culprit’s side. Politicians from many sides have condemned his equivoques which may be construed as supportive of any side. David Duke, on the other hand, cautions Trump to choose his words carefully so as to remember what side his base is on. Keeping in mind that Fields, Jr. is innocent until proven guilty, here are the facts: the killing happened at a rally called “Unite the Right,” a combination of white nationalist groups including the Klan, neo-Nazi groups, and Richard Spencer, who marched with torches the previous night and chanted “White lives matter” and the Nazi chant “Blood and soil.” The car plowed into a group of protesters who can be seen holding “Black Lives Matter,” “Love,” and “Solidarity” signs. Fields Jr. was seen marching with Vanguard America, whose slogan is “Blood and Soil,” though the group claimed no responsibility for Fields. The AP reports that Fields Jr. has been charged with one count of second-degree murder, three counts of malicious wounding, and one count related to leaving the scene. He will appear in court on Monday.